Government regulation of business is one of the nation’s most politically-divisive issues. Since 1987, a majority of Americans have agreed with the statement that “government regulation of business usually does more harm than good,” according to the Pew Research Center’s political values surveys. But within that number, there has been a growing partisan divide since the election of President Obama. By 2012, 76% of Republicans said government regulation did more harm than good compared to 41% of Democrats. A new survey conducted this month found a continuation of this trend. The survey was conducted in the context of assessing the public’s view of the economy five years after the 2008 financial meltdown during which many banks and other financial institutions failed or faltered. As sweeping new rules governing the banking industry kick in under the Dodd-Frank Act passed in 2010, the survey conducted in early September found that 64% of Republicans believe the government has gone too far in regulating financial institutions compared to 26% of Democrats – a 38 percentage point difference. In fact, 62% of Democrats believe regulation has not gone far enough, compared to 32% of Republicans. 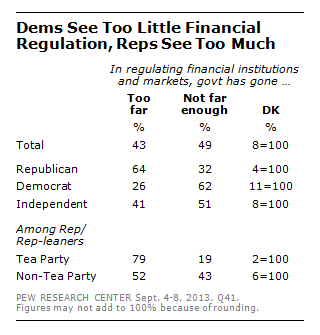 Independents fall in between, with 41% saying regulation has gone too far, and 51% saying it hasn’t gone far enough. Eight-in-ten Republicans believe that the nation’s economic system today is no more secure than it was before 2008 while views among Democrats are mixed, with 51% saying the economic system is more secure and 45% saying it is not.